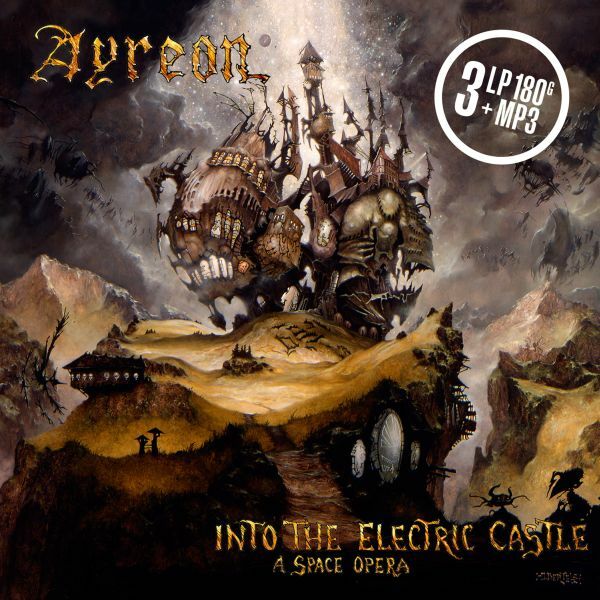 AYREON - INTO THE ELECTRIC CASTLE 20 ANNIVERS. VINYL EDIT. (3LP+MP3 BLACK) | Online Shop | Wizard LTD. Album: "INTO THE ELECTRIC CASTLE 20 ANNIVERS. VINYL EDIT. (3LP+MP3 BLACK)"
After The Final Experiment and Actual Fantasy (Revisited), it&apos;s time for part 3 in the Ayreon-on-vinyl saga. Original vinyl copies of Into The Electric Castle are fetching a small fortune, and it is by far one of the most requested titles for a vinyl release. Coincidentally, it&apos;s also the 20th anniversary since it was first release. Arjen says: "Although my first Ayreon album, The Final Experiment released in 1995, was an (unexpected) success, my second album, Actual Fantasy, wasn’t received with the same enthusiasm. So I had to make sure that my third release would be absolutely mind-blowing, otherwise it could well have meant the end of Ayreon!" For the 20th anniversary, Arjen re-mixed the audio to 21st century standards. He made it clear that it&apos;s a &apos;re-mix&apos;, not a &apos;re-master&apos;, saying "Re-mastering takes 2 hours, this re-mix took me 2 months!"